I wish I could attend this upcoming conference. I’m grateful to those making the effort to broadcast portions of the conference live. Years ago, it was easier for me to get to the various lectures, symposia, conferences and fellowship gatherings. Life has become much more complicated. Click on the image on the left if you are interested in learning more about the conference to be held in Mesa 24-25 March 2018. Another upcoming event that may be of interest to some, especially those in the Southern Utah area is a regional fellowship gathering to be convened 20-21 of January 2018 in Parowan. The invitation is posted publicly on Facebook and I’m sure you will be welcomed. Living in Southern California all my life, I’ve treasured the times I have been able to get to events like these. I’ve come to appreciate the value of fellowship among those who hold the same beliefs. I made a very public statement a few years ago that got a lot of attention, at least among the LDS blogging community. I decided to get rebaptized after reading Denver’s books and attending a series of lectures on the gospel. In the early days of the LDS Church, it was a common thing to get rebaptized. Today, if you do so, you open yourself up to discipline from those who preside over your local congregation. In my case, having served in numerous local leadership councils and not wanting to go through that process, I simply resigned my membership in the LDS Church. I don’t mean to imply I did so without much soul-searching and prayer. I spent many a night on my knees envisioning the ramifications of what I was about to do. My greatest concern was how this would affect my marriage. At times I was certain my wife would divorce me because of my decision. I was baptized over three years ago. Before I tell you how I think it’s going, let me add some background in response to my other friend’s questions. He asked me to record my thoughts in video format to post on the blog, Zion’s Return. I’m pondering that request. I did a video interview with KUTV a few years back about the LDS Church cracking down on bloggers. It’s funny how news organizations can ask enough questions to record a half hour of footage but only use two or three five-second snippets. I invite you to visit Zion’s Return. Question One: “How did you come to find out about what the Lord is doing today and about this movement?” That’s an easy one to answer. I was standing in the Celestial room of the Los Angeles temple about six years ago when a friend asked me what I thought about Denver Snuffer’s latest book, Passing the Heavenly Gift. I said, “Denver who?” He repeated the name. “Never heard of him,” I said. End of conversation. But the name stuck with me. Over the next few weeks, often while praying, that name would pop into my mind. I love to read about LDS Church History. 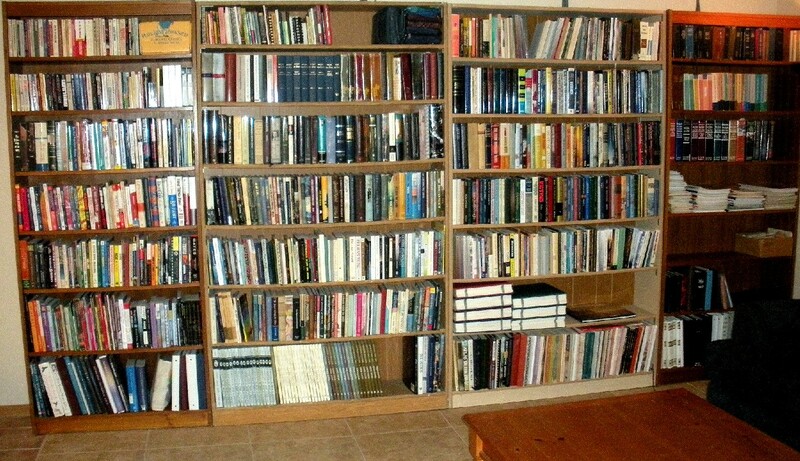 Carol and I have a large library. I inherited many books from my parents who at one time had an LDS book store. I was in the habit of adding new books about the LDS Church to my library on a regular basis. Finally, after about three weeks, I bought the book on Amazon. Question Two: “What brought you to the point of feeling like something was missing in your spiritual life/journey?” I suppose I always had this nagging feeling in the back of my mind that something wasn’t quite right with what I was being taught in the official curriculum and what I was reading in the books in our family library. My mother loved biography. She was a public school teacher and read voraciously. I’m fairly certain we had every biography published about the prophet. I learned to keep my thoughts to myself, or more accurately, I learned what the expected responses were to the typical questions and what the sources were for those questions that always come up when studying church history. I kept thinking if I just study harder I’ll understand things the way they were explained in the Sunday School manuals I taught from and the Institute manuals from which I later studied. I went on a mission, got married in the temple and began thirty-five years of service in Elder’s Quorum Presidencies, Bishoprics, High Councils, High Priest Group Leaderships and finally as the Stake Financial Clerk. I saw the book had arrived when I came home from work a day or two after ordering PtHG, started my usual quick perusal of the book and ending up reading it until two o’clock in the morning. I simply could not put it down. Here was someone who had done the research, presented the evidence and let the reader draw their own conclusions. My prayer that night was one of the most memorable of my life. I knew my life was going to change forever. I finally had my answers. The cognitive dissonance lifted from my mind. I literally felt encompassed in light. This was not the first time I had experienced such a thing, but never this powerful. Question Three: “What is the greatest blessing you have received since going [into] this movement and / or hearing the message the Lord is delivering in our day?” Again, another easy question. I have received a baptism that will be recognized when the angels begin to sweep the earth with the foretold destruction and, just as important, I have received a covenant that allows me to join with the Saints when they gather to Zion for protection from the events of the great and terrible day we read about in Matthew 24. Question Four: “What insight/understanding do you now enjoy that you didn’t have before and how has that impacted your life?” I’ve been labeled crazy, deluded, deceived and possessed of a devil. My bishop at the time of my resignation wrote in his formal letter of response that went to my file in Salt Lake: “I fear your blindness has come from looking beyond the mark (Jacob 4:14).” He also noted that because I was under discipline for apostasy, approval from the First Presidency would be required for readmission. I think the greatest insight or understanding I have received and now enjoy is the confidence of knowing my path is pleasing to the Lord. That is one of the things Joseph taught we must know to exercise faith in God. Carol and I have talked several times about starting that process of readmission to the LDS Church. While I enjoy attending sacrament meeting with Carol each Sunday and especially enjoy singing in the choir, I have felt there is no way I could write that letter to the First Presidency. There are still too many things taught in the LDS Church that I consider doctrinally damning, such as the concept of keys and authority. Question Five: “Have you had any significant personal experience or witness that you can share that may benefit someone else who is seeking truth? * A witness that God answers prayer? *Baptism by fire? * Pivotal experience that shaped your spiritual journey?” This is a tough one, mainly because relating events from your life you consider sacred can be and are easily misunderstood. I still like President Packer’s analogy of explaining spiritual experiences to someone who has never had one: “My friend, spiritually speaking, I have tasted salt and you have not. I am [not] able to convey to you in words how this knowledge has come…” If you want some fascinating responses to this anecdote, Google “Packer Salt Story.” Especially read the Reddit post. However, unless two people share the same spiritual experience such as Joseph and Sydney, there can never be a complete unity or common understanding of what just happened. I know. I have tried on many occasions and in many posts on my blog. One is the baptism of fire I experienced when I was just seventeen. You can read it but may come away with only a cursory understanding that I had a nice long prayer and felt good when I was done. Yet, to me, it was a baptism of fire, pure and simple. I knew I had been in the presence of the Lord. I heard the voice of the Lord declaring I was His son, begotten of Him that day. I make no claim to having received the Second Comforter at that time nor any other promises or blessings besides forgiveness. Question Six: How has your worship and relationship with God, your family and/or others changed because of the added truth you’ve received? Hmmm…while Carol and I have always read, studied and taught from the scriptures (we both taught seminary), we have implemented a practice of reading aloud and teaching each other from the scriptures every single night. Up until a few years ago it was hit and miss. We’d go for a few months then peter off. I treasure these nightly sessions of reading and teaching each other as the highlight of my day. Of course, I slip in insights gained from reading Denver’s commentaries. We’ve had some especially interesting discussions lately about what it really meant for the Savior to lay aside his glory, his exalted status. There are some subjects we don’t discuss because they are too painful. For example, imagine how Carol feels as a fifth generation Mormon believing all her life that the highest LDS goal is to marry in the temple. She felt terribly betrayed when I resigned from the LDS Church. There are still bitter tears when the subject comes up in Sacrament meeting or especially when we read something about marriage in the scriptures. My relationships with others have changed. I am much more interested in people I work with every day, and how I can serve them. I attribute this directly to rebaptism and acceptance of the covenant of Christ at the September conference. Once again, let me express how grateful I am to those who arranged for me to participate from home. On the drive home from the lecture, as Carol napped through the California desert, I had a long talk with the Lord about what had just happened. Lecture ten was not like the others. It was time to take action. I heard it clearly. I think Carol also felt it but was not prepared, and still isn’t, to make the kind of changes that were brought up at that last lecture. I knew I needed to show the Lord I believed his servant by an outward sign, the ordinance of baptism. This was a deep, profound, and thoroughly life-changing talk. By responding as I did, I knew I’d be laying everything on the line, all because I heard the voice of the Lord tell me the words of his servant Denver were pleasing to him, and required action if I wanted to continue to grow and progress spiritually. Question Eight: “How [have] your family, friends and other relations been impacted by this, and how do you deal with that? Why are you willing to risk everything for what you are learning?” Interestingly, my siblings have said nothing of my leaving the LDS Church. We still communicate regularly, get together occasionally and express our love for one another. My sister closest in age to me will be leaving to serve a mission in England in a few months. I recently had an interesting conversation with my niece about how millennials perceive the church. She sees so many of her friends who have left and attributes it to the stuff they find on the Internet. On the other hand, some members of Carol’s family are not happy with me and have told me so very clearly. I knew this would happen. The Lord showed it clearly to me all those nights I was praying about it before I resigned. I am grateful to our local ward and stake leaders who continue to reach out to me with love, kindness and respect. I am still invited to and attend ward socials. I still sing in the ward and stake choirs and generally enjoy Sacrament meeting. The biggest impact this change has had on me is obviously on my marriage. Carol does not like it when I write in my blog, which is a major reason I stopped for so long and rarely write here anymore. You asked about risk. The greatest risk I face is in not doing as the Lord asks. He has asked me very plainly to do all I can to reassure Carol of my love for her and yes, be willing to apply for readmission if it is the only thing that will save my marriage. The Lord takes marriage seriously and so do I. Marriage is the fruit He labors to lay up in store. Question Nine: “Why does all this matter so much to you?” I don’t think I’m any different from anyone else when it comes to the gospel of Christ. It should be important to everyone. What’s surprising to me is how many people can’t separate the gospel from the LDS Church. Even the thought is abhorrent to so many who have opposed what I have shared on my blog. I can truly understand why Denver turned off comments on his blog years ago. I can only imagine the awful individual emails he receives from those who feel and express he has ruined their families. What a burden he must carry. I know a little about doing what the Lord asks, meaning, I have felt the displeasure of the Lord when I have been slow to hearken after I’ve asked for His direction. This matters because it gives me hope. I have a goal in my old age to see Zion established, and that’s not going to come about through a large institution. The signs are becoming more and more evident that we are living in the generation that will see the return of the Lord. I rejoiced when I heard that a temple is to be a part of this effort to establish Zion. I want to contribute to the building of that temple. 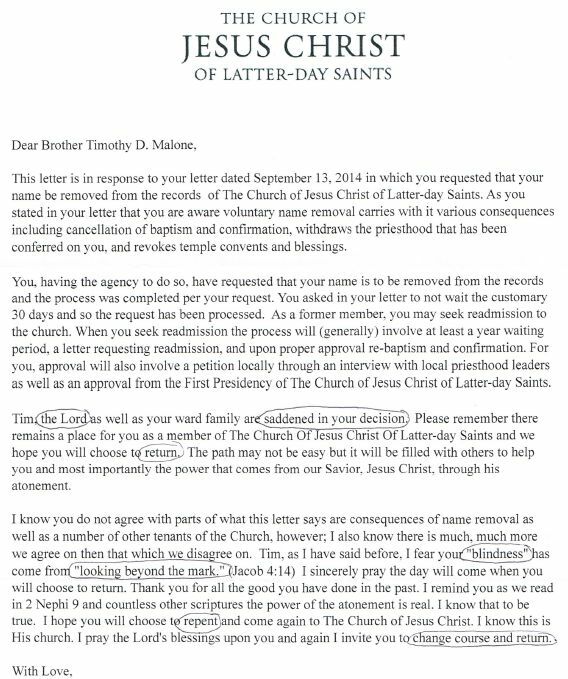 I want my name to be in the book that will be presented to the Lord when the temple is completed. I am grateful to know there literally is a book being kept and that my name is in it today. That baptism is so essential. Oh, how I wish more people understood this. I am saddened by but understand why so many can’t separate the gospel from the LDS Church. Question Ten: “Anything of your background, briefly, that may have been worth noting at the beginning that would enhance what is shared.” There’s no way I can condense ten years of blogging into ten questions. I started my blog with the intention of providing sensible answers to all the misinformation about the LDS Church that was popping up on the Internet. Along the way I kept finding more and more legitimate questions being asked by young people who had real concerns about what they were reading in newly-available historical records and what they were being taught in the official curriculum of the LDS Church. There’s a lot to love about what this great institution has accomplished, but it became obvious, at least to me, that something very basic was missing. I couldn’t quite put my finger on it so, like so many others, I put my concerns on the shelf. If I had not read PtHG I would probably still be serving somewhere in the Stake as a clerk, which for some reason I seem to do well, probably because I manage computer networks for a living. Two fundamental things changed. I realized open revelation had ceased with Joseph Smith. I also came to understand the priesthood very, very differently. The Higher Priesthood is not received the way it is taught in the LDS Church. It must come by hearing the voice of God declare it unto you. To my friend who asked for advice on how to make his marriage work when he no longer believed as his wife, I can only offer the following: Put yourself in her shoes for a minute. Don’t forget that a person’s greatest emotional need is to feel appreciated. Being right is not as important as being kind. I’ve referred to it earlier and I’ll reiterate it here. If the Lord were to ask me to apply for readmission to the LDS Church. I would do it in a heartbeat, especially if it would bring happiness to another, in this case, to Carol. I have received baptism in the way I believe the Lord has asked and have accepted the covenant of Christ as it was offered. I can’t imagine the LDS Church asking me to deny or retract the covenant I have made with Christ, can you? It seems to me one should be able to worship and fellowship in the LDS Church or the Baptist Church or the Presbyterian Church or any fellowship that acknowledges Christ. A man can believe what he wants in the LDS Church. I’ve heard some pretty crazy things over the years from someone everyone would consider an orthodox member. Knowing what I know now about keys, I can sustain the Brethren. In fact, I do so every time we have a stake conference. I can pay tithing to the LDS Church but I would pay it differently than I have all my life because I understand it differently now. But who am I to give advice on marriage? Go talk to the Lord. Very nice comments, Tim. I appreciate your thoughts. Thank you for your story. I do not know you, and have never heard of you or read your blog before. So this was, in a way, good for me as a first exposure. I live in Missouri, and cannot relate to your experiences of seeing Denver in person; but I can relate to the response you’ve received. The week my wife and I were baptized in the Missouri River in secret was the same week we were excommunicated. Bizarre coincidence, perhaps? I would counsel you to keep Matthew 10 in mind if you ever up end up proceeding with an application for re-admittance to the LDS rosters of membership. We can lose our salvation for putting family members above Christ, be it spouse, child, sibling, or parent. D&C 76 also states that if we put apostles or prophets above Christ, we will go to hell and stay there until the resurrection of the unjust, to come forth as unclean and unjustified souls worthy of telestial glory at best. So if you are required to set any man above Christ or any policies of men above the laws of Christ in order to be readmitted, you may wish to think on whether Christ’s forgiveness and justifications for your actions are really possible. You already have his words on the subject of whether he should come before your marriage. Be courageous. No one wants to sever a marriage, of course. But if push comes to shove, it is better to have Jesus. Our family members cannot save us. I’m sure you’ll pray sincerely about anything of such gravity. Just be sure you do not fall into the trap of praying for an answer when God has already revealed the answer in scripture. We must study things out in our mind BEFORE we ask about them. If we take no thought but to ask him, we open ourselves to false answers from deceiving spirits. Best of luck. And again, great story of sacrifice and courage. Thank you for posting. Thank you Tim for baring your soul. This is my perspective. I pretty much gave it to you years ago, when Denver came out with the choice to baptize anew. It hasn’t changed much. My perspective is not profound – certainly superficial. But it is a perspective from someone who was interested in Denver Snuffer and yet remained in the LDS Church. I was interested in having a movement occur within the Church (if there is a need for one). The one mighty and strong would have a difficult time “setting in order the house of God” if he is not even in the house of God himself. Of course, others could interpret this differently. In my mind, if the Lord wanted to make changes for the latter-day restoration, He would do so within the Church, not start something new, calling an audible so late in the game. I mean the restoration is really just starting to get going – it’s only 188 years into it. The turmoil that this would cause with the people having to seek out a new testimony, change loyalties, adjust to new culture, new perceptions, the break up of families, the list goes on and on. I have been critical of the Church, but I am not as cynical as most on the internet about everything they perceive the brethren to be. On the whole, I trust the brethren. They are not tyrants. They are not Sadducees and Pharisees, whited sepulchers on the outside and dead as men’s bones on the inside. They are good, honest, faithful men, who I believe, still hold the keys of the kingdom. Surely, if Denver had wrested the keys away from the LDS Church, someone in this group would have taken notice and defected. In my opinion, these men are not hardhearted and past feeling to not have noticed that the Lord had given the keys to another restoration group, who now has the keys to seal on earth and heaven, perform saving ordinances, etc. Truly, Denver’s claims are great. These are not subtle claims, but rather bold claims stating he has wrested the keys of the kingdom of God with all power and authority for Mankind’s salvation to start afresh. I just have difficulty in believing this has occurred with not one member of the twelve, nor a member of the seventy feeling this and seeking out this movement and this movement’s baptism. Is there not one Alma in our church’s midst? Perhaps a more important question, is our current church to be likened unto the wicked King Noah’s church? I just don’t believe that to be the case. By their fruits ye shall know them. The LDS Church’s fruit is not evil, not taking away people’s freedom, but good – loving, giving, helping, etc. I guess, it is more likely, in my mind, that Denver is more like a Korihor than He is a John the Baptist. Of course, you have prayed about this and have received your own witness, so it is what it is. I wish you well in your spiritual journey. We would love you back in the LDS Church. You are a great person with much to offer in the kingdom. As for this person’s reference to Matthew 10, you both believe you are accepting Christ. Carol isn’t rejecting Christ by staying with the LDS Church. This, I believe, was not a good analogy. I greatly enjoyed and appreciate your comment. Amen to just about everything you said. I have to laugh about the Korihor comment. Every time we read that chapter, Carol points out to me a name she has written in her margins. You can imagine who it is. You got me thinking about the “One Mighty and Strong” again. I think I understand your logic that such an individual must come from within the Lord’s kingdom. But is the Lord’s kingdom limited to the LDS Church? Or more specifically, is the LDS Church the Kingdom of God on the Earth? And your comments about the Brethren were spot on in my mind. I have great respect for these men. I also believe they are good, not whited sepulchers. As far as them taking notice of Denver’s claim to have wrested the keys of the kingdom away from the LDS Church, whose to say they have or haven’t? They certainly wouldn’t say. I often read wishful thinking on other blogs that an Alma is going to come forth from the Brethren. I may be wrong but I don’t believe that will happen. These men have devoted their lives to the LDS Church and for the most part, their livelihood depends on their service. What would become of them if they were to give some credence to Denver? The LDS Church is doing so much good, both at the highest levels and especially locally. I continue to be amazed at how devoted, kind and loving people I am privileged to associate with each Sunday. I would not counsel a person who is receiving spiritual nourishment from the LDS Church to leave. But is there something more that we need? Love you brother. Thanks for taking the time to read and comment. Thanks for the cordial response. It is nice to actually interact with others on the internet without all of the vitriol, hate, and ignorance. I knew you wouldn’t react that way, but it still caught me off guard how pleasant you are. 🙂 It’s so rare. As for the question of having to be within the kingdom of God, I would have to assume the one mighty and strong would be where the keys of the priesthood would be. So, I guess if the keys are not with the LDS Church, then it would have to be wherever they are located. What would become of the brethren if they were to give credence to Denver? Nothing worse than what was going to happen to Alma had he been caught. Is there something more that we need? I would have used to have said “Yes” to this question. But having served in the calling I have for the last few years, I have changed my mind. I have realized that I am more unique with my curiosity and inquisitive mind. No, unfortunately with the vast majority of members, we are right where we need to be, if not still too far ahead of their comprehension. Let’s just preach faith and repentance only to this generation. So, I do have a few questions for you. 2)	Do you not believe there needed to be some act of key transference? When Joseph Smith received the keys, John the Baptist and Peter, James, and John literally came to him giving him the keys. Would this not have to happen again with Denver? Did anything like this happen? Would there not be a “sign” of some sort indicating the transference of the priesthood keys? 3)	Joseph Smith desperately asked the Lord for witnesses to the golden plates to not only relieve him, but to also have witnesses to enable more faith in potential converts. Was there anything tangible like this with Denver’s restoration movement? Have angels and other heavenly messengers visited others besides Denver? 4)	Do you believe LDS church members who have never heard of this new movement (the vast majority) will be held accountable before God for not receiving this new baptism? How is anyone (including LDS members) supposed to know about this new, heaven-approved baptism? Is the movement sending out missionaries? 5)	Since the saving ordinances for the dead in hundreds of temples across the world are no longer effective since 2013, is the Lord just putting the saving work for the dead on hold? What is being done to keep this necessary work advancing? Tim, anything you can offer here with these would be appreciated. I don’t mean to overburden you with all these questions. I’m legitimately curious. Wow, that’s a lot to consider. There’s no way I could give authoritative answers to some of those questions. I’ll share what I believe. I am still learning and asking the Lord as I continue to read and study. Q) How do we know they [the Jews] … had the priesthood keys at [the] time John the Baptist overthrew the kingdom (D&C 84:28)? Q) Do you not believe there needed to be some act of key transference? A) Yes, I believe the keys of a new dispensation have been conferred. Q) When Joseph Smith received the keys, John the Baptist and Peter, James, and John literally came to him giving him the keys. Would this not have to happen again with Denver? A) I believe you are correct. Q) Did anything like this happen? A) Since God is the same yesterday, today and tomorrow, it stands to reason that such a transference would be in accordance with the order of God. I have searched through as many of Denver’s writings as I have in electronic format for a statement where he says, in effect, “I have received the keys of a new dispensation.” I have been unable to find any such declaration, although it seems inferred or implied in one of the ten lectures. Q) Would there not be a “sign” of some sort indicating the transference of the priesthood keys? A) I wonder. Did the Jews notice they had lost the keys of the kingdom? Q) Joseph Smith desperately asked the Lord for witnesses to the golden plates to not only relieve him, but to also have witnesses to enable more faith in potential converts. Was there anything tangible like this with Denver’s restoration movement? Q) Have angels and other heavenly messengers visited others besides Denver? Q) Do you believe LDS church members who have never heard of this new movement (the vast majority) will be held accountable before God for not receiving this new baptism? A) I believe we are all in a self-selection process. We each decide how much we want to know for ourselves if this new baptism is valid, required and if having our names recorded in the temple book is important to us. Q) How is anyone (including LDS members) supposed to know about this new, heaven-approved baptism? A) Word of mouth, numerous web sites, email groups, fellowship gatherings, conferences, but typically one to one, such as my experience, even though I don’t think the individual who brought it to my attention expected me to respond the way I have. Q) Is the movement sending out missionaries? A) I don’t speak for the movement, but I am aware of individuals who have taken it upon themselves to go door to door seeking individuals with whom they could share the messages of the Doctrine of Christ. I also know of individuals who have taken out advertisement in newspapers to invite people to hear the message, particularly the three lectures in 2017. Q) Since the saving ordinances for the dead in hundreds of temples across the world are no longer effective since 2013, is the Lord just putting the saving work for the dead on hold? A) I have a different understanding of temple work than I used to as a member of the LDS Church. I believe the sealing that we need to receive is to be sealed to the fathers, or the patriarchs as we know them from the Old Testament. I wonder if any sealings are valid other than those administered by the prophet Joseph up until the sealing power was taken away. Baptisms, being an ordinance of the Aaronic priesthood, need to be considered separately. This is a difficult subject, one that causes much consternation in considering it. Passing the Heavenly Gift addresses this very subject in great detail. Q) What is being done to keep this necessary work advancing? A) A temple is being planned. I hope it will be constructed in my lifetime. Q) Paul states in Ephesians that apostles and prophets are needed in the church. Christ organized a church in Jerusalem and then in the new world, Christ in 3rd Nephi ordained 12 with power to baptize and organize the church. I know this new movement doesn’t like this traditional hierarchical structure. So, how is this restoration movement structured? A) It is organized in fellowships which was outlined in the tenth lecture. Q) Is there a revelation attached to this move away from revealed structure? Comment from Mark: If I am not mistaken, I read where Denver believed that Zion is to be gained through a more flattened hierarchy, the traditional ones have all failed. My thoughts on this: Yes, much has been discussed in the forums and the email groups and by Denver in the lectures about the idea of a Strongman. And yes, I concur with what you described as a more flattened hierarchy. It is a very different concept from the traditional LDS top-down model. Just re-read your “Wisdom thru The Ages” post from 12/31/17. Wisdom indeed! I wish you would post more often. You do in fact have a beautiful testimony of the restored Gospel and I always find a spiritual lift in the things you post. Happy to see my hands still displayed on your blog!